Ni hen ai nide shouji. English translation: You love your cell phone. What’s surprising to me is that the Chinese language isn’t that difficult. The grammar is actually very straightforward. For instance, if I am going to Hong Kong tomorrow the structure is ‘I tomorrow go to Hong Kong’ – subject, time, place, verb, object. I am simplifying it, but that’s the gist. For me though, there is one aspect that makes it very challenging: Pronunciation. Sure, some of the words seem similar -natian, jian, tian- but take for instance the word ‘nali’. Depending on how you say it, it means two different things. One meaning is ‘there’ and the other is ‘where’. It’s where you stress the syllable. In this case, the ‘a’ sound – one is naaah-li and the other is nah-li. And let me tell you, I cannot tell the difference. 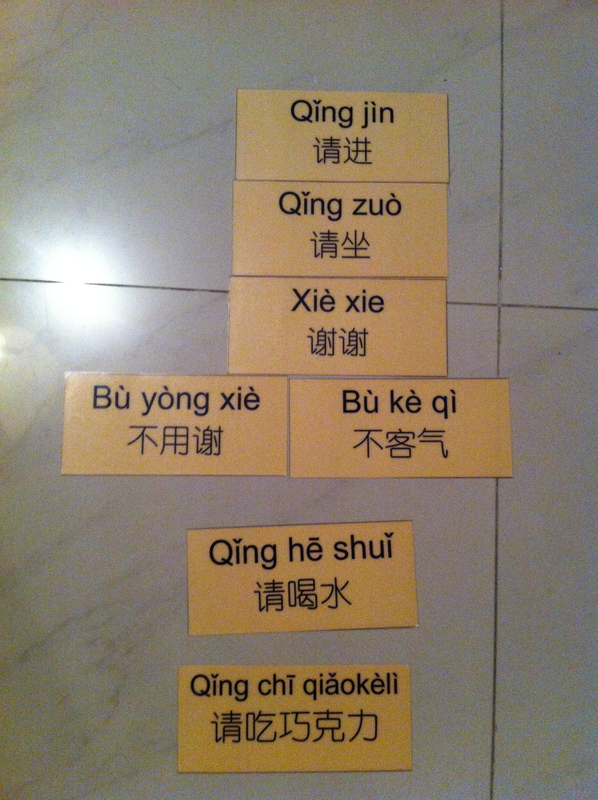 Most Chinese are helpful as I fumble my way around this new way of speaking. However, sometimes they look at me like I am saying something in Swahili. The other day, this guy in my favorite coffee house was telling me something and I asked ‘why’ in Chinese – I pronounced it wah-she-may, and he looked at me like I was crazy and seriously, he was like, ‘Oh! Whey-she-may’… I thought, I just said the same thing! The nice part about all of this though is that I feel more a part of things as I learn the language. For instance, my Chinese friend Holly recently opened up a nail salon. It was fun because I was the only Westerner in the place and I actually understood small bits and pieces of the conversations around me. Then as I was hailing a taxi to go home, one of my usual drivers pulled up and offered me a ride – Holly was impressed. I was a rock star at that moment. Welcome to my Monday and Thursday nights! Living on the edge baby, China style. Tai hao le! “She turning Chinese, I think she’s turning Chinese, I really think so….” da da da da da da da….